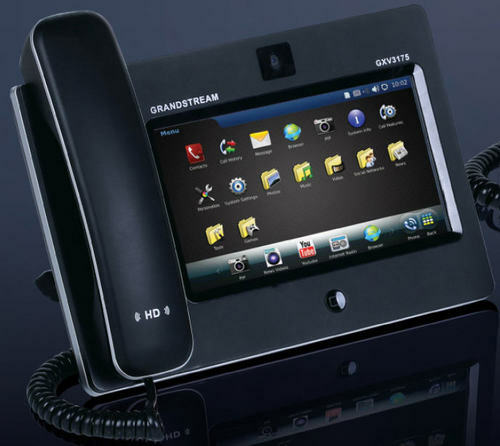 Grandstream has just released the GXV3175, a multimedia phone which features HD voice and video with the ability to connect the output of the video conference to an HDTV. Moreover, the Linux-based desk phone which sports an easy to use seven-inch touch-screen interface supports widgets for checking things like the weather or stock quotes. There is support for IM from Google, MSN and Yahoo as well as social networks such as Facebook and Twitter. Another great feature is integration with Photobucket and Flickr and other photo sharing services. This phone could very well replace a Sony Dash on a desktop as it not only does much of what that device does but adds real-time multimedia communications. 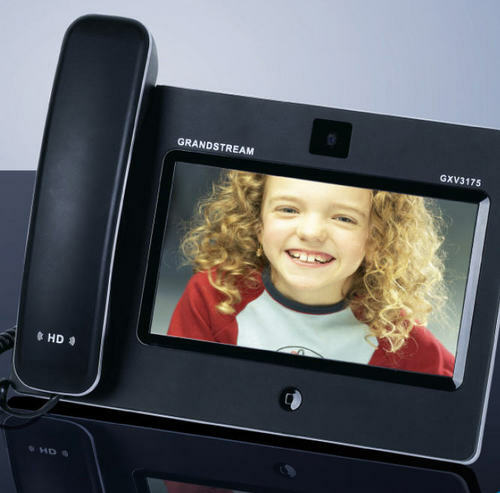 There are lots of other features including a 1.3 megapixel CMOS camera with privacy shutter as well as dual USB ports, integrated PoE, WiFi and memory card support. Moreover you can have three SIP accounts and browse the web via an integrated browser. At under $320 $369 (the video above refers to what will likely be the eventual street price) the GXV3175 is a solid value and a good-looking addition to any desk.